Our farm is situated between the vineyards, 2 km from the town, we do not recommend the use of GPS navigation and Google Maps in the area. From the A4 Milan-Venice exit Sommacampagna; just come out turn right and go straight until the traffic light; at the traffic light, following signs for Custoza, turn right and after 50 mt, on the left; go straight up to Custoza (about 5 km); 50 mt after Custoza sign you will find our signs: turn left in via Gorgo and go up to the sign pointing to turn left into small road Bianchette (at the Eco center) (see detail); continue to the top of the hill. Coming from Brenner Modena, suggest taking the exit on the A4 towards Milan and always exit at Sommacampagna. Catullo airport: Leaving the airport, turn right and continue up to Villafranca di Verona (4.3 km); arrived at a roundabout, keep right and follow the signs for Valeggio; at the next roundabout (you will have the company Montorsi on your left) keep right and go straight for another few km. Leaving Villafranca, you will see signs for Custoza, turn right and reached the town Coronini (at the foot of the Custoza hill) turn right in via Gorgo (direction Sommacampagna); after 700 meters on the right, you will find our sign: turn right on small road Bianchette (in echo matching center) and continue on the road to the top of the hill. From Verona reach Sommacampagna and then to Custoza. 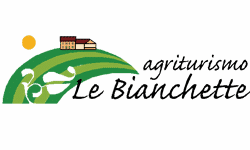 Agriturismo “Le Bianchette” di Sperotto Lucia e C. s.s.
Agriturismo "Le Bianchette" di Sperotto Lucia e C. s.s.